JENKINSON, Hon. Robert Banks (1770-1828), of Coombe Wood, nr. Kingston, Surr. b. 7 June 1770, 1st s. of Charles Jenkinson†, 1st Earl of Liverpool, by 1st w. Amelia, da. of William Watts, gov. Fort William, Bengal, later of South Hill, Ascot, Berks. educ. Parsons Green, Fulham; Charterhouse 1783-7; Christ Church, Oxf. 1787. m. (1) 25 Mar. 1795, Louisa Hervey (d. 12 June 1821), da. of Frederick Augustus, 4th Earl of Bristol, and bp. of Derry, s.p. ; (2) 24 Sept. 1822, Mary, da. of Rev. Charles Chester (formerly Bagot), s.p. Styled Lord Hawkesbury 1 June 1796-1803; summ. to the Lords in his fa.’s barony as Baron Hawkesbury, 15 Nov. 1803; suc. fa. 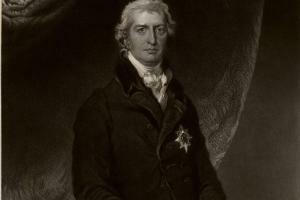 as 2nd Earl of Liverpool 17 Dec. 1808; KG 9 June 1814. Commr. Board of Control Apr. 1793-9; PC 13 Mar. 1799; member of Board of Trade 1799; master of Mint 1799-1801; sec. of state for Foreign affairs Feb. 1801-May 1804, for Home affairs May 1804-Jan. 1806, Mar. 1807-Oct. 1809, for War and Colonies 1809-12; first ld. of Treasury May 1812, 16 June 1812-20 Apr. 1827; commr. of treasury [I] 1814-17. Ld. warden, Cinque Ports 1806-d.; receiver-gen. duchy of Lancaster July 1807-June 1819; master Trinity House 1816-d.
Col. Cinque Ports fencible cav. 1794, militia 1810.
was at that time, as he has appeared ever since, singularly good natured. He was much ridiculed, seldom being addressed by any other name than ‘Jenky’, excepting always indeed by Lord Molyneux, who always called him either ‘delightful’ or ‘beauteous fair one’; his manners were effeminate and cold, and were rendered still more unpleasing by an almost constant state of absence of mind either real or affected. When his father sent him to Paris in 1789, he introduced him as ‘an excellent scholar, rather an elegant figure, of perfect morals and of a disposition that I am sure will please you’.1 An eye witness of the fall of the Bastille, he was supposed to have made his mind up there and then against Jacobinism. Although not of age, Jenkinson was returned in two places in the election of 1790. Lord Lonsdale, whose Member his father had once been for Appleby, returned him there unsolicited, on condition only that he voted as his father did. His father had meanwhile been casting about for a seat for him and found one for Rye, where he came to terms with the Lamb family. Jenkinson thereupon gave up Appleby in December 1790, though he had to wait until the following year to take his seat. In April 1791 he was marked ‘abroad’ on a list of opponents of repeal of the Test Act in Scotland. His father put him under the same tutelage to Pitt as he had himself been to Lord Bute, and Pitt entrusted to this élève, with his airs of ‘excessive importance’, the reply to Whitbread’s critical motion on the armament against Russia for his maiden speech, 29 Feb. 1792. This exposure of Russian ambitions was an ‘amazing success’, played down by opposition to goad Pitt, but lauded by the latter, for it contained ‘more information than ever appeared in a coup d’essai’ and was delivered ‘without a falter’, for more than an hour.2 On 8 Mar. he was invited to the ministerialist meeting at Downing Street and he acted as government teller on 27 Apr. and 8 May 1792.
it was a set speech, composed and delivered in mimicry rather than imitation of Pitt, but so inferior, and I think so puerile in manner in spite of all the confidence, arrogance, and conceit that could belong to a veteran, that he put me in mind of a monkey brought in to dance on the rope after a principal performer! He will do, however, in the world; for those qualities which make a man odious and unamiable in private life are very successful in public, especially when added to great application, and probably both to ambition and every other branch of the selfish and interested passions. I was on the whole, disappointed with him, but he is nevertheless an extraordinary boy. He makes more faces than his father, and is so ludicrous in action and grimace that his language has hardly fair play. On 13 Dec. 1792 Jenkinson was deputed to stand in for the lord mayor of London if the latter arrived too late to move the address, and on 15 Dec., in Pitt’s absence, opposed Fox’s amendment for a negotiation with France, in a manner that gained Burke’s applause. He had no time for the prospect of a coalition government incorporating Fox. On 4 Jan. 1793 he defended the aliens bill and on 18 Feb., in an ‘incomparable speech’, moved the previous question against Fox’s pacific resolutions, which were easily disposed of.4 On 26 Feb. he advocated indefinite postponement of the abolition of the slave trade (modifying this on 25 Feb. 1794 to the duration of war). By 6 May 1793, when he ably opposed Grey’s motion for parliamentary reform, he was in office, as a commissioner of the Board of Control: nor, except for the interlude of 1806-7, was he ever out of it again until his last illness. He was government teller 15 times in the session of 1793. He was also a member of the committees to relieve the suffering of the French clergy and laity and to review Warren Hastings’s impeachment. I really cannot crouch to young Jenky whom I have laughed at ever since I have known him and my habits of considering him as a ridiculous animal are so rooted, that I am afraid I cannot easily be brought to admire him as a minister. In the interval before the ratification of the Treaty of Amiens, 26 Mar. 1802, Hawkesbury sparred with Grenvillite critics of the peace in debate and aided Addington in debates on Ireland and the Prince of Wales’s debts. On 29 Apr. he laid the treaty before the House and after replying to its critics delivered his vindication of it on 13 May. It was a defence of splendid isolation: his faith in the peace could not extend to a commercial treaty with France. On the address, 23 Nov. 1802, he met with more jaundiced views from Fox and Canning, and his reply, though boosted to his father as ‘admirable’, was in other quarters thought ‘very lame’. Even when on 2 Dec. he justified a precautionary military establishment against Fox, in a tone which Pitt might have inspired, Addington shrank from such boldness; and Pitt now refused to advise him. 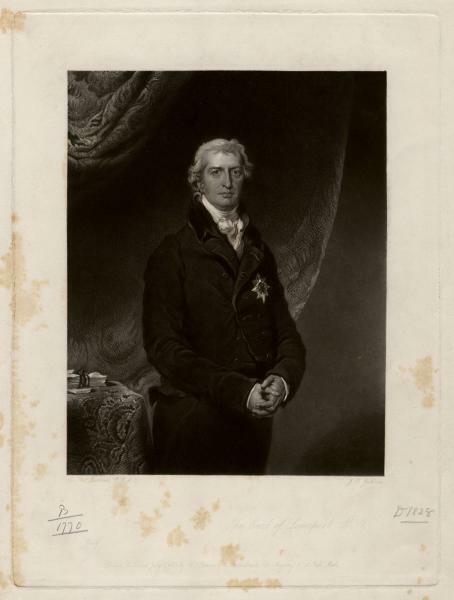 There was a rumour that, with Castlereagh now in the government, Hawkesbury might go up as Home secretary to the Lords, where reinforcement was needed; but it was agreed that his loss would be sorely felt and he remained for the present where he was.13 In justifying an isolationist foreign policy in reply to Thomas Grenville on 9 Dec. 1802, he complained of a campaign to secure the dismissal of ministers ‘without cause assigned’. He was a spokesman for government on the Middlesex petition, against Burdett, 7, 20 Dec., on the Admiralty inquiry, 13 Dec., and on 7 Feb. 1803 defended the renewed stoppage of Bank payments against its critics. On 9 Mar. 1803, when defensive precautions against French aggression were announced, Hawkesbury defended his conduct towards France, which he was sure was irreproachable even if war ensued. Two days later, in reply to Fox, he justified the vote of supply as a prudent countermeasure. On 6 May, with war imminent, according to Grey he ‘sat shaking like a man under sentence of death’ when he put in his plea for the adjournment of the House. The need for more adjournments before the final rupture of negotiations with Buonaparte further exercised his nerves, and on 20 May he had to meet a barrage of opposition questions when he justified the rejection of the Russian offer of mediation. On 24 May he made ‘a very elaborate speech of two hours, containing little inflammable matter, and being a fair and reasonable representation of his case and justification of the war’. It incorporated what were jocularly referred to as his ‘seven good reasons for not giving up Malta’. In his ensuing call to arms, Pitt pointedly referred to Hawkesbury as ‘his noble friend’. On 27 May he moved the previous question against Fox’s pacific motion, which he alleged had no parliamentary ground or use, and asserted that the Russian offer of mediation came too late to avert war. On 1 June his father wrote approvingly: ‘You are ... the principal ornament and support of the present government, and Mr Addington is in truth little more than an instrument supported by you; if you withdraw your support and countenance he would fall at once’. The point of his letter was to argue against Hawkesbury’s going up to the House of Lords, evidently as Home secretary, to take the lead there, which was again sur le tapis, the Speaker having reported on 22 May, ‘Lord Hawkesbury is to go up to the House of Lords immediately after these questions’. Liverpool urged that as Addington could not last and Pitt’s health was poor, his son might look to the premiership: it would therefore be premature to accept the elevation, particularly as Liverpool was being asked, as a corollary, to give up the duchy of Lancaster, with its yearly increasing income, as part of the arrangement.14 A decision was suspended until the session was over. Broken at length by the strain of office, Liverpool suffered a stroke in 1827 and died 4 Dec. 1828. 1. Gent. Mag. (1829), i. 81; Leveson Gower, i. 8; Add. 38310, f. 34; 48244, f. 52. 2. Leveson Gower, i. 35; Add. 38310, ff. 54, 61, 218; 38566, f. 74; 38567, f. 207; 38580, ff. 27, 31, 39; Geo. III Corresp. i. 740; SRO GD46/17/6, Johnston to Stewart,  Mar. ; Harewood mss, Canning to Rev. Leigh, 27 Mar. ; Public Advertiser, 8, 10 Mar. 1792; Sheridan Letters ed. Price, i. 238. 3. Minto, ii. 4; Auckland Jnl., ii. 439. 4. Add. 34448, f. 238; 48244, f. 156. 5. Add. 33630, f. 24; 51706, Pelham to Lady Holland, 15 Apr. ; Sidmouth mss, Mornington to Addington, 3 May; Harewood mss, Canning jnl. 26 Apr., 26, 29 May, 14 June 1794; Canning and his Friends, i. 133. 6. Harewood mss, Canning jnl. 16, 18, 29, 31 Dec. 1794; 3, 5, 20, 24 Jan., 5, 21 Feb., 16, 24 Mar. ; Canning to Rev. Leigh, 7 Feb. 1795. 7. Add. 38310, f. 150; BL 1102.h.12(11). 8. SRO GD51/1/200/15; Add. 38310, f. 156. 9. Wellesley Pprs. i. 90; Abergavenny mss, Liverpool to Robinson, 9 Feb. 1799. 10. C. D. Yonge, Life of 2nd Earl of Liverpool, 39; Add. 38311, f. 68; 48246, f. 105; Glenbervie Diaries, i. 157-8. 11. Geo. III Corresp. iii. 2365n; Glenbervie Diaries, i. 205; Colchester, i. 260. 12. Glenbervie Diaries i. 179, 221, 269, 295; Malmesbury Diaries, iv. 63; Chatsworth mss, Duchess of Devonshire jnl., 2 Mar. ; Malmesbury mss, FitzHarris to Malmesbury, 29 Aug. 1801; PRO 30/8/157, f. 286; Add. 37880, f. 160; 38833, f. 96; HMC Fortescue, vii. 45; Leveson Gower, 309; Colchester, i. 376, 378-381. 13. Add. 35702, f. 56; 38236, f. 231; Buckingham, Court and Cabinets, iii. 219, 245; Rose Diaries, i. 464, 467, 510; ii. 489-90; Grey mss, Tierney to Grey, 4 Dec. 1802; Minto, iii. 265. 14. Grey mss, Grey to his wife, 24 May 1803; Creevey Pprs. ed. Maxwell, i. 15; Minto, iii. 287; HMC Fortescue, vii. 151; Colchester, i. 421; Add. 38236, f. 258. 15. Add. 35714, f. 107; 38236, f. 278; HMC Fortescue, vii. 170; Farington, ii. 105; Lonsdale mss, Ward to Lowther, 14, 20 Nov. 1803. 16. Brougham, Hist. Sketches (1839), 293-8; Brydges, Autobiog. i. 181-2. 17. Staffs RO, Hatherton diary, 16 Nov. 1844.